This is the medium version of the Feldman Lighting Company's brass lotus chandelier or pendant, beautiful original brass patina. Uses 1 - 60 watt max "A" base bulb. If desired it can be professional polished for $275 and will take up to 3 weeks. Retains label. Chain can be added and fixture rewired for pendant use, inquire on additional cost. Hollywood Regency at its best. Please see my other listing for the larger version. Nice original patina to brass, see description. 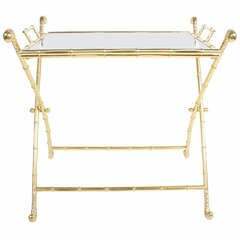 Brass folding X-base stand with brass framed and glass removable tray. Vintage Michael Taylor for Baker Furniture Co. ottoman with brass castors. Original ebonized finish and upholstery, seat raised on brass cylinders. Label. Small brass lotus pendant by Feldman. Can be polished if desired for additional $125 Lotus is about 10" diameter by 8" plus 18" adjustable chain. Tom Greene, Feldman Lighting Co. Medium brass lotus form pendant ceiling fixtures by Feldman.